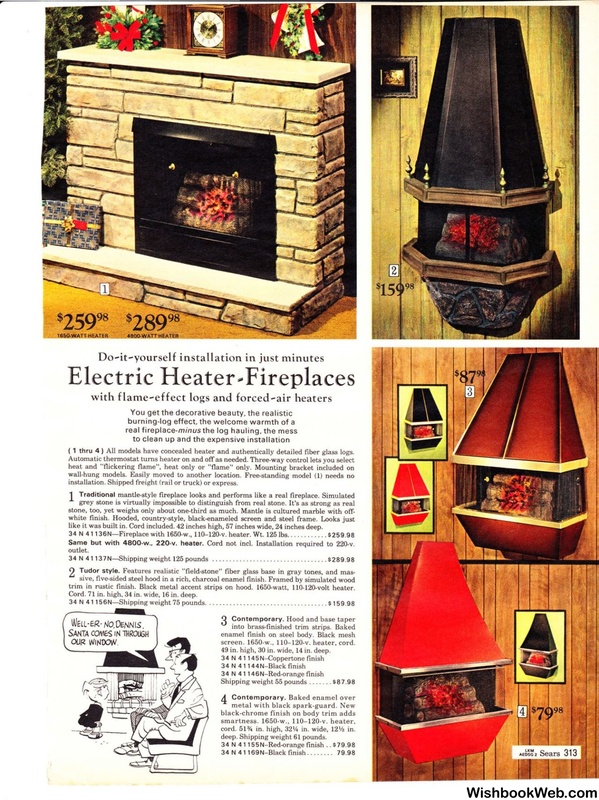 ( 1 thru 4) All models have concealed heater and authentically detailed fiber glass logs. installation. Shipped freight (rail or truck) or express. like it was built in. Cord included. 42 inches high, 57 inches wide, 24 inches deep. Same but with 4800-w .. 220-v. heater. Cord not incl. Installation required to 220-v.
34N41137N-Shippingweight125pounds . . .. . . . . . . . . . . . . . . .
trim in rustic finish. Black metal accent strips on hood. 1650-watt, 110-120-volt heater. Cord. 71 in. high, 34 in. wide, 16 in. deep. 34 N 41156N-Shipping weight 75 pounds. .... . . . ....... . .
screen. 1650-w., 110-120-v. heater, cord. 49 in. high, 30 in. wide, 14 in. deep. smartness . 1650-w., 110-120-v. heater. deep. Shipping weight 61 pounds.